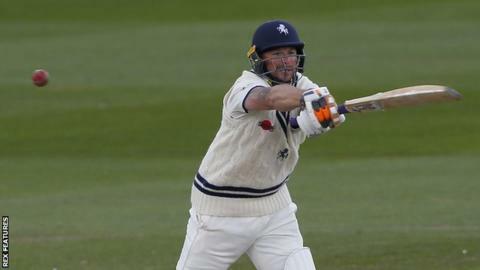 Kent all-rounder Darren Stevens hit a 96-ball century to guide them to a draw with Leicestershire at Grace Road. Starting the final day on 193-5, 41-year-old Stevens reached his ton before lunch against his former county, but was caught at mid-off two balls later. He and Adam Rouse (60) shared a sixth-wicket stand of 152 as Kent declared on 462-9 before tea - a lead of 42. With both teams earning maximum batting points they shook hands, with the hosts on 61-2. The Foxes are still waiting for their first County Championship victory of the season, but they will take heart from being the first side to stop Kent winning in this year's competition. After successfully avoiding the follow-on in the morning, Kent finished their innings with a flurry, with Matt Coles thumping an unbeaten 56 off 38 balls and James Tredwell (55) also making a half-century as the pair added 89 for the tenth wicket. But with so much time lost to rain on the first two days, a draw was the only realistic result and the sides agreed to end the match as a draw after Will Gidman took a smart catch to remove Leicestershire's Harry Dearden off Matt Hunn following Paul Horton's dismissal for 40.